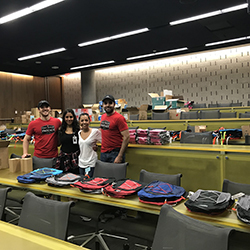 Two University of Arizona students have started a program to help Phoenix’s homeless population by providing individualized health care and connecting them with health care services and resources. 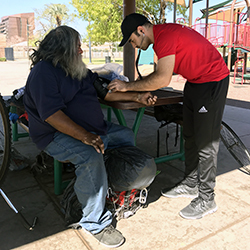 In May 2017, Justin Zeien, a second-year medical student at the University of Arizona College of Medicine – Phoenix, and Jeffery Hanna, a graduate student in the Clinical Translational Science program at the College, created Street Medicine Phoenix when they learned about similar programs in other metro areas. 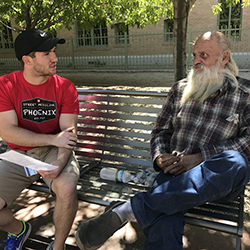 With the help of a grant provided by the BHHS Legacy Foundation, the pair conducted a needs assessment survey to determine how they might be able to eliminate racial disparities in the homeless population and reduce Phoenix homelessness in general. “Street medicine is a way to provide compassionate, humanistic care to underserved, vulnerable, and often forgotten homeless people,” Hanna said. The concept of street medicine started more than 20 years ago in Pittsburgh when James Withers, MD, identified a gap in health care for the homeless. Dr. Withers’ model inspired Zeien and Hanna to start Street Medicine Phoenix and involve students and faculty from other professional programs on the Phoenix Biomedical Campus such as nursing, physician assistants, pharmacy, occupational therapy, physical therapy, public health and social work. ​Zeien and Hanna are working with other street medicine initiatives across the United States, including Street Medicine Detroit at Wayne State University and Spartan Street Medicine at the Michigan State University College of Osteopathic Medicine, along with the Street Medicine Initiative, a national group, to develop a program for students in health care. The goal is to implement a curriculum in graduate health professional programs to equip students from various professions with knowledge and training on how to care for people experiencing homelessness using a holistic, person-centered approach. The primary faculty advisor and medical director for Street Medicine Phoenix is Jennifer Hartmark-Hill, MD, director of the UA College of Medicine – Phoenix Capstone program. Street Medicine Phoenix is one of the programs under the SHOW (Student Health Outreach for Wellness) Community Initiative umbrella, for which Dr. Hartmark-Hill also serves as medical director. Other faculty advisors include Cecilia Rosales, MD, MS, from the UA’s College of Public Health and LeeAnne Denny, MD, from the UA College of Medicine – Phoenix. “This is a team-based experience that students are not going to get anywhere else,” Dr. Hartmark-Hill said. “It’s an opportunity to reach out to patients who've fallen through the cracks of the health care system. 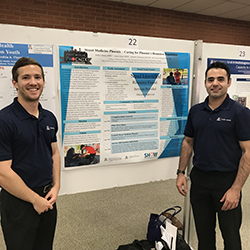 Interprofessional student and clinicians are able to provide care to patients in the context of their current environment and condition, before they present to the emergency department. We want to get patients connected to a medical home and wrap around services that address social determinants of health, like housing, access to food and employment." About 20 students have signed up for the program, but more are needed. Training for street runs will be held in October with the first street run with interprofessional teams in November. During the street runs, teams of students with preceptors will ask homeless individuals about their needs, provide health care if needed and wanted, and provide general health education. An important part of the encounter will consist of referring them to community resources to meet their needs on a long-term basis. Learn more about the Street Medicine group or email info@streetmedicinephoenix.com.